Want to set your favorite font style in your android Oreo 8.0? It’s quite easy to change font size and display size on android Oreo devices. By default set font size in android Oreo and other devices. Also change screen density on android Oreo phone. In font size, you can make the text on screen smaller or larger you like. 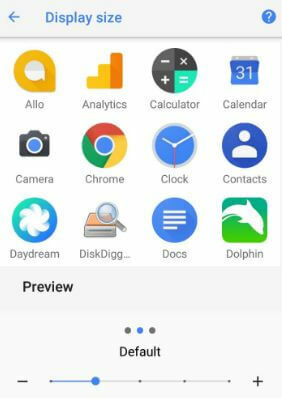 In latest android 8.0 Oreo versions, when change display size in android Oreo, you can view preview of both font size and apps icon on your screen change. By default font size set as larger and display size set in your android 8.0 devices. When change font size in android Oreo, your device screen change. You can also download fonts and emoji in android Oreo devices. 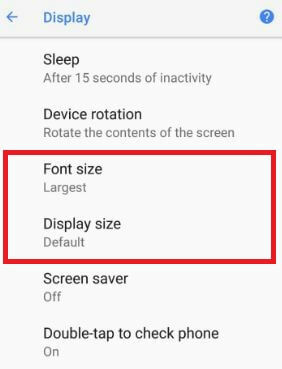 Check out below given step by step guide to change font size and display size on android Oreo 8.0 devices. There are 2 ways to change display size, font size and font style in android 8.0 Oreo devices such as Google Pixel, Pixel XL, Nexus 6P, Nexus 5X and other android Oreo 8.0 supported devices. 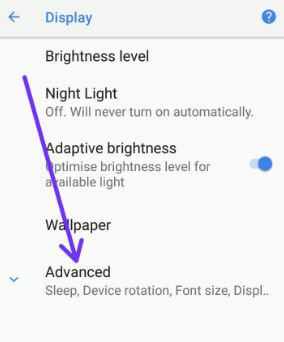 You can see Brightness level, Adaptive brightness, Wallpaper, Sleep, device rotation, font size, display size, screen saver, moves gesture and Night light mode in android Oreo 8.0 device. By default set largest font size in your android Oreo device. To change font size smaller, swipe slider to left side and see preview above the screen. After set font size android Oreo, tap on back button. You can download more fonts style and change font style in android Oreo if you doesn’t like by default font in your android 8.0 devices. You can set display size to larger / larger / largest in your android device. When change display size in android Oreo, you will see change icon size in android Oreo 8.0. Here you can see various sections including, screen readers, download services, display, interaction controls, audio & on-screen text and experimental. 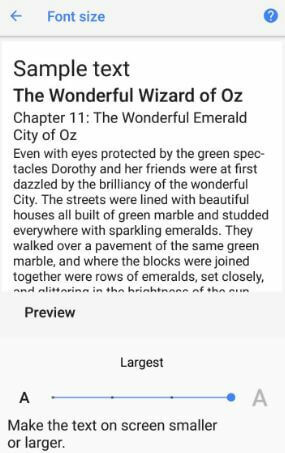 Set font size you want to use in your android Oreo. Change display size may affect in your device screen apps and icon size in your android Oreo. That’s all. 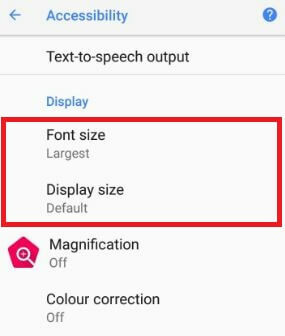 We hope this make clear how to change font size and display size on android Oreo 8.0 devices. If you have any problem, don’t hesitate to let me know in below comment box.